You can't see it here but the stamp on the back of this old photograph reads "July 1969." A lot happened that month. Apollo 11 astronauts Neil Armstrong and Buzz Aldrin walked on the moon and the first U.S. troops left Vietnam. New York Mets ace Tom Seaver lost his bid for a no hitter with only two outs left in the ninth. Brian Jones, the original leader of The Rolling Stones, drowned in his swimming pool. And, in a tragedy that would haunt him the rest of his days, Ted Kennedy pleaded guilty to leaving the scene of a car accident on Chappaquiddick Island in Massachusetts, an accident where a young woman named Mary Jo Kopechne had died. Very early that month, July 4th to be precise, something a bit less noteworthy occurred: I learned that if ever I was to grow up and become a man I would need to learn how to build a fire, drink a cold beer, and cook an enormous amount of sausage, peppers and onions for the people I love. Please don't ask me why. It's just what we're supposed to do. And you know it. I could look at this picture a thousand more times and every time the tastes inside my head will be the same. Not a red pepper or garlic clove or onion slice or fennel seed's bit of difference. It's the way I like it. The same. Every time. Uncle Joe does the cooking because it is his backyard, his makeshift brick-and-cinder block fire pit, and his party. Uncle Dominic consults with his brother and drinks his cold beer. The rest of the family, thirty of us perhaps, wait for my uncles to announce that it's time to eat. Somewhere nearby I am watching and learning. Summer is coming. Time to man up. 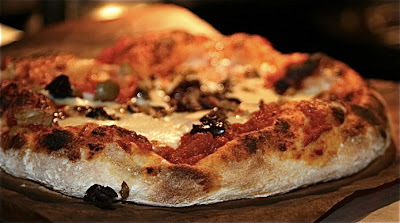 The last great pizza I had was at Brooklyn Central, a new Neapolitan-style joint in my old neighborhood. We're talking thin crust wood-fired pizza here. With just the right amount of char and, equally important to me, lots of beautiful bubbles. "You like these?" I said pointing to one of the three pies on the table, the Margherita I believe. "The bubbles I mean. You think they're a good thing?" I was speaking to my friends Tom and Beth, fine pizzaioli in their own right and regular customers of the place where we were eating. Tom, the verbose member of the pair, spent the rest of the pie-eating session advocating the bubbles-on-pizza theory. Not only that, but he actually knew what he was yammering about. Clearly my friend had studied this crucial topic, so much so that I asked him to share his knowledge with all of us here. Bubbles are a sign of great pizza, but they're more than that. Bubbles give baked goods their tender character, from the delicate sponge of a chocolate layer cake to the flaky layers of a croissant. Depending upon the baked good, the bubbles come from carbon dioxide created by leavening such as baking powder used in cakes or butter folded into puff pastry dough. Pizza gets some of its bubbles from yeast, a beneficial microorganism that converts fermentable sugars in the dough into carbon dioxide. But the bubbles our friend Meatball was so fixated on at Brooklyn Central derived from a different source: steam. When vaporized, water expands over 1,600 times in volume, according to Paula Figoni, writing in her book, How Baking Works. For this phenomenon to work, though, the dough has to be wet, soft and loose, and the oven must be super hot. That's exactly the conditions called for by the Associazione Verace Pizza Napoletana, a group dedicated to preserving the Neopolitan pizza tradition. AVPN sets forth the exacting principles governing the one true pizza, and its regulations are many and persnickety. Dough can only be made from ultra-soft double-zero flour, with 1 liter of water to 1.8 kg. of flour ration, with the flour absorbing 50-55% of its weight in water. That translates into a wet, almost sticky dough, with a soft and elastic texture, says the AVPN. Ovens must be hotter than Dante's Inferno, with a minimum floor temperature of 905 degrees, and a cavity temp of 800 or more degrees; the pizza cooks fast, in 60-90 seconds. 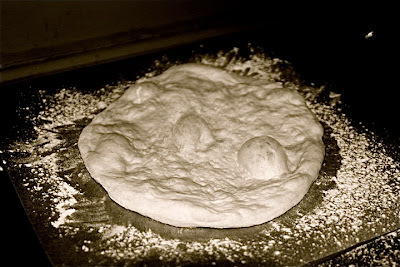 When the pizzaiolo slides that pie (14 inches in diameter, 0.8-inch thick crust, 0.1-inch thick in the center) into the oven, water in the mix vaporizes, the wet glutinous dough is flexible enough to stretch and contain the vapor, then the extreme heat dries and chars the bubbles. The end result: a delicate, light and airy crust. I got to experience this magic hands-on at Forcella, a New York restaurant devoted to Neapolitan pizza. Under the tutelage of certified pizza master Giulio Adrian, I learned to properly handle the demanding dough, shaping a certifiable crust, topping the classic Margherita with San Marzano tomatoes, mozzarella di Bufala, fresh basil leaves and a drizzle of extra-virgin olive oil, and baking it in Forcella's imported Italian oven. I'm sure the AVPN would approve. Even better, when that blistered, bubbled pie was whisked out on a peel, I got to eat it. Get a good look at this stuff, okay. Because it ain't gonna be around for very long. No matter how many jars of pickled eggplant that I make, I'm always in the planning stages for the next batch. It's my go-to sandwich condiment. Has been since, well, I can't actually remember when it wasn't. And don't ask how many loaves of crusty bread I'm plowed through with nothing but this stuff on top. Oh yeah, and it's a snap to make. So let's get going on that, shall we. Place in a colander and liberally toss with salt. Weight the strips down as best you can. The idea here is to extract as much moisture from the eggplant as you can (make sure there's something under the colander to catch the liquid). I usually let this go for a couple hours and frequently toss things around and manually press down on the strips during that time. These strips are in good enough shape to work with. Drain the vinegar and then, using your hands, squeeze the eggplant strips as dry as you can. Place in a jar, add a couple chopped cloves of garlic and some crushed hot pepper. Then cover in extra virgin olive oil. I'll usually wait a week before eating the eggplant but three or four days should be enough time to allow the flavors to develop. And it'll keep in the fridge for a long time.